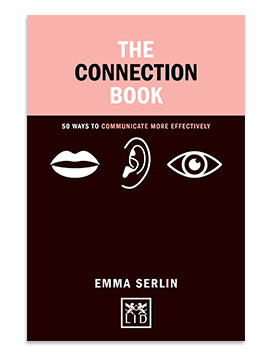 Emma Serlin’s new book The Connection Book: 50 Ways to Communicate More Effectively makes the proven Serlin Method™ for effective communication available to everyone. We hope you enjoy the read and would love to hear any comments you have. 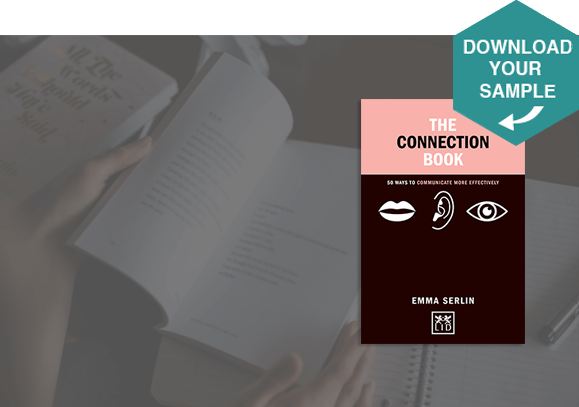 This book will give people simple usable tools to improve and enrich their communication in 5 key areas, so they feel more confident and effective in meetings, presentations, interviews, social situations and can even have arguments more effectively! For the very first time, readers will be able to read about and apply a unique methodology that has been taught successfully to hundreds of happy clients since 2008 – and the opportunity to experience gems from that method at a fraction of the price of a session. Communication is central to every interaction we have. In fact, every decision we make is likely to be influenced by communication in one way or another. And yet, the view seems to be that you either have this life skill, or you don’t! This book debunks the idea that good communication is a talent you are born with. It gives readers simple, practical advice as well as tools to improve and enrich their communication in five key areas, so that they feel more confident and effective when communicating in professional and personal situations alike.